I know this is going to be one of those posts that may evoke some interesting responses but I am going to have a go at it anyway. I think I have actually touched on this subject before and I am not sure exactly where I am going with it but today’s give away bought it to mind. Some of the hardest and most guilt ridden things to declutter are items that were handmade with love just for you. Now these items are always given with the best of intentions but with the perceived added obligation of appreciating the time taken to make it for you in the first place. I recently came across one of these items when decluttering my camphor wood chest. It is today’s declutter item so you can scroll down and take a look now if you wish. 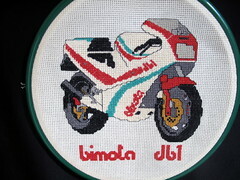 I made this for my husband about 20 years ago when he was really into motorbikes. Now I don’t think it has been on a wall in our home for at least 10 years but probably longer. In this case there was an easy solution to this problem because I was the one who made it for him and I was also the one to ask him if he was willing to let it go. This freed him of any obligation of being polite and trying not the hurt my feeling. Unfortunately it isn’t always this easy. I know I have at least two other item lying idle in my home that fall into this category. One was made for me by my mother and one by my father. They were great at the time that I received them but I soon found they didn’t really suit my needs well. So I am just going to have to practice what I preach and add them to the donation box. If I am ever asked what happened to them I am either going to make up a story of some unfortunate event that caused their demise or admit I wasn’t using them and got rid of them. I am pretty sure which option I will go with because I really have no problem with using little white lies to protect peoples feelings. Even this option is not too hard for me because lets face it my parents live 1000km away and rarely visit. So all I can say to anyone with this category of declutter item is be true to yourself and do what you must. Always remember though (I am speaking from personal experience here) that the person who made the gift got as much satisfaction out of accomplishing the task of making it as they did at giving it so their satisfaction has already been half fulfilled before your part was played. Back on days 180 and 182 was when we touched on this subject. With the decluttering of this item we can add 10 more years to our decluttered years tally making it 79.5 in total. I don’t recommend white lies and they are still lies and can often come back to bite you. What I have done to take care of this is to say up front with people who are gift givers that I love receiving gifts but I am not sentimental about them. So if some point comes along when I no longer feel they suit my taste or have a purpose I may give them away of sell them. I think that most people who know me now know this about me. I don’t have to worry about being asked about something. I also try to make it clear to those I give to that I feel the same way as far as something I give them. I try to make sure that anything I give is something they want at the time but I also tell them that I know that over time we change and they don’t have to keep it forever and put it out when I come visit. It’s so freeing. I agree with everything you have to say. Luckily I don’t find that I resort to the little white lie tac tic too often if ever. Sometimes I think we problable exagerate in our own heads about how much the gift giver would really care about how much importance we place on the gifts they give. I knew this would be a topic of interest to you. I also know you approach your gift giving in such a beautiful way and I commend you for that. I was wondering if you agree with the last statement I made in my post about the maker of the gift already receiving great satisfaction just for having accomplished the task in the first place. As for me feeling better, I am getting there slowly. Thank you for asking. To answer your question–I think it depends on the knitter. Me–I’m a process knitter and what you expressed is basically true for me. I learned long ago that my kids might not like the finished product and my relationship with them was WAY more important than the item I knitted. So if they want to dispose of it, they can. Usually they just send it back to me 🙂 For the product knitter–I don’t know. Maybe someone else can address that. If the whole point of the project is to have the thing done and finished and given to a loved one, then perhaps there will be more ‘ownership’ involved in the item given. thanks for that. Let’s hope someone else has an opinion. I would like to see this thing from all angles. I’ve made and given away a bunch of stuff over the years, and for the most part completing the project was a good part of the satisfaction and I wasn’t concerned about the recipient keeping it for all eternity. On a couple of projects that I did by request (really nice framed cross-stitch) I have told the recipient that if they ever get tired of it or find it doesn’t work for them anymore, let me know and I’ll gladly take it back. you are so funny. Throw the thing out…perhaps you should have made them something new and brought it in as a replacement. I do like your approach in your first paragraph as well it lets the receiver know they have options and no obligations. I’ll be following the answers to this one closely as I have a number of these things hidden away. Ahem. It certainly helps if the giver specifically says to pass it along if or when it doesn’t suit your tastes or needs. other members of the family do have to decide for themselves but like you say if they make up for it in other ways we can forgive them their weaknesses. I am sure we have enough of our own. It is both the process and the end product that I like about handcrafting things. But being on the receiving end of so many handmade items that I never used or particularly liked, and feeling like I needed to keep them, has led me to make only items that are specifically requested, or items that I want for myself, or items I want the experience of making. And I think my little feelings would be too hurt if I put all that work into something and someone felt about it the same way I feel about many of the things I’ve gotten! The irony of it all!! Not sure if this is any help or even makes sense! I understand exactly what you are saying. It really is a dilemma this one with so many facets and no right solution. Just was reminded of something my dd said the other day. When she knits (yeah, she caught the bug from me) a baby sweater for a new baby, she looks at what the MOM wears. If the mom likes it and it’s her own style, she’s more likely to put it on the baby. I think we as givers of handmade gifts have the responsibility to make what the recipient will like and wear. Just because I love blue and wear it all the time doesn’t mean that my dark haired daughter in law is EVER going to wear blue. that all sounds like very good advice. Thanks Willow. What a great idea to see what the mom wears! Love your blog. I’ll be back for more ’cause I am SO into pile reduction as of late. welcome to 365lessthings I am glad you are enjoying the read. I hope you find some useful tips and advice not only from me but from my readers. I liked your story about the mantel scarf. It was probably not the most pleasant situation for you but God bless your mom for feeling comfortable enough with you to say such a thing. You must have a great relationship. Keep reading and I hope to hear from you again soon. hoo boy! This is a subject I’ve been immersed in for years and years, since there are so many handcrafters in my family (a family of handcrafters and packrats–talk about a double whammy). Like the others here I tell my recipients to feel free to pass the item on, to repurpose the materials, or to even give it back to me to repurpose if the item no longer suits–and make it clear I had the fun in making it. I do still have several things from years ago which I will remake into crazy quilts for guest bedding. This will give me the enjoyment of knitting and crocheting over the winter, and also enable me to stick to my vow not to buy any more yarn, as we are on a hand to mouth budget. As far as white lies go, I’ve no one to answer to anymore other than my parents, as all the other gifters have long since passed away. once again a great attitude to gift giving. I so love your last paragraph because I think this is the route I usually end up taking as well. I am not really good at not being honest and you are so right it sets everyone free. We have 3 extra thick chunky wool fisherman’s rib type sweaters and a bright turquoise cardigan which DH’s late mother made for him before he was married (40 years ago!). He hasn’t worn the jumpers once in the twelve years I’ve known him – he just finds them way too hot – and the one time he wore the cardigan I fought not to laugh. His daughter was less inhibited and asked what on earth did he think he looked like. They fill a large drawer by themselves, but he won’t let them go because his mum made them for him. I suggested I could make a cushion cover from each one, then they’d be on show so he would be able to remember her better, (he never opens the drawer to look at them) but she made them as jumpers, and that’s apparently how they have to stay. Short of introducing them to a very hungry family of moths, does anyone have any suggestions? I think Willow has the best suggestion I can think of. Mind you I did like the moth idea as well. You will have to look at the comments from Day 235 to find Willow’s suggestion. Let him keep the jumpers his mother made. Sounds like it brings him comfort on some level. And I’m a great de-clutterer! I think it’s perfectly acceptable to take measures to spare another’s feelings. If you need to tell a little white lie in the process, I think that’s fine. it does sound pretty harmless to me. This is excellent food for thought. Years ago, I tried always to give something handmade at Christmas. At the same time, I was a person who couldn’t stand knick knacks, and couldn’t stand clutter, and one day it occurred to me that I was just giving people things that would end up as “clutter” in their homes. Since then, I’ve made it a point to give consumable items or cash as gifts. I don’t have any problem with somebody getting rid of something I’ve made for them, but I still struggle with knowing what to do with things that others have made for me, and for things I’ve already gotten rid of, I hope I never get asked because I’m still not sure what I’d tell them. what you say here proves how many facets there are to this issue. We feel like we are doing a beautiful thing… but are we. We feel guilty for getting rid of this sort of clutter… but should we. We think it may insult the giver… but will it. And so on…. Before I started getting into minimalism, I was regularly decluttering and having garage sales. When I knew a certain person was coming to check out my sale items, I would hide the things that she had given me that I had enjoyed but no longer wanted, because I knew she would be offended. We often had discussions about “keeping gifts” out of guilt. When she would ask me to help her declutter, she’d tell me how she didn’t like a certain item, but so-and-so had given it to her and she felt she should keep it even though so-and-so had been gone for years! In my argument I would use the analogy of a vase of flowers that you give to someone as a gift. When the flowers fade and die, would you expect the receiver to hold onto the flowers forever? Would you expect to see them in her home next month? Of course not. She enjoyed them for a season, and then it was time to move on. So it is even with items that don’t die or break. When they outlive their usefulness or pleasure-giving, it’s time to let go. I like that analogy of the vase of flowers. Actually it is funny, the more I talk about a subject here at 365lessthings and the more useful feedback and stories I get from my readers the more immune I become to the topics situation. I have got to the point now where I figure if someone is so sensitive about what they give people it is their problem not mine and am not going to own it for them. No more unwanted gifts for me. Ahhh another freedom gained.